Major-General Elkins was born on 13 June 1883 at Sherbrooke, Quebec. He graduated frp, the Royal Military College, Kingston, in June 1905 and was commissioned in the Royal Canadian Artillery; his first posting was to “B” Battery, Royal Canadian Horse Artillery (RCHA). In his early years he served with “N” Battery, Royal Horse Artillery in India, and while on the sub-continent completed his Captain qualifying examination. He returned to Canada in 1910 and served one year with each of “A” and “B” Batteries. He gained a reputation for his skilful handling of his men and for his dedication to the achievement of high training standards. During the winter of 1912 Lieutenant Elkins served temporarily on the Artillery Staff in the office of the Chief of the General Staff, Ottawa. He went overseas with the 1st Canadian Division and after spending nine long and frustrating months in England, took his guns to Flanders in July 1915 as part of the Royal Canadian Horse Artillery Brigade. Following a three-month period of relieving individual batteries of the Canadian Field Artillery in the line, the Brigade finally engage the enemy as a formation on 23 November. By Christmas of that year he was appointed to command “A” Battery and one year later assumed command of the Brigade. Promotion to Lieutenant-Colonel was to follow in June 1917. In December he was evacuated due to illness and convalesced at the Prince of Wakes Hospital for Officers at Marylebone. He returned to duty with the Brigade in time for the German Offensive in the Spring of 1918. This major enemy action necessitated a significant regrouping of the available artillery. In a remarkable display of tactical understanding and leadership, Lieutenant-Colonel Elkins controlled the movement and deployment of his own two batteries as well as twelve additionally assigned batteries. This feat included a withdrawal of more than fifty-six kilometres in ten days while under constant enemy pressure. A command of this size was normally a job for a Brigadier with a sizeable staff. On the morning of 10 October 1918, a Royal Field Artillery Battery along with “I” and “N” Batteries, Royal Horse Artillery were placed under his command. In an operation supporting an attack on the high ground north of Montay, the Canadian s advanced eight miles on a front of more than three miles, too 400 prisoners and captured a large number of enemy weapons. This type of fluid action was suited precisely to the Canadian Horse Gunners and provided a gratifying final success for the Brigade. This action earned Lieutenant-Colonel Elkins a Bar to his Distinguished Service Order. A great civic welcome awaited Lieutenant-Colonel Elkins and his Brigade in Kingston on 31 May 1919. The city revelled in the achievements of “its” Brigade and welcomed them home as heroes. Lieutenant-Colonel Elkins and his Brigade returned to their usual peacetime duties of training the militia; he continued in command until 1922 when he was appointed Commandant Royal Canadian Garrison Artillery, Halifax. Other successive appointments were Camp Commandant Petawawa, another short term as Commander of the RCHA Brigade and Chairman of the Standing Arms Committee. He was promoted Colonel in 1925. On his subsequent promotion to Brigadier in 1930, he was appointed to command the Royal Military College, a post he held until 1935. Major-General Elkins was appointed Commander of the Most Excellent Order of the British Empire on 1 January 1935 and in November 1938 was appointed Master General of Ordnance. In 1943 he was appointed Commander of the Most Honourable Order of the Bath; he retired in 1944. 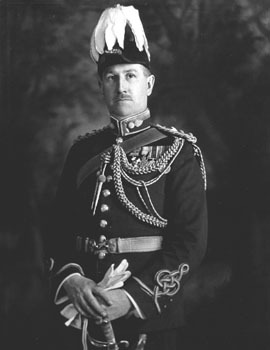 With service spanning both World Wars, Major-General Elkins greatly influenced the evolution of The Royal Regiment into a modern fighting arm.